Unilever PLC (UL) operates in the fast-moving consumer goods market in the Africa, Americas, Asia Pacific, Europe, and Middle East. The company operates through Personal Care, Foods, Refreshment, and Home Care segments. Unilever increased its quarterly dividend by 6% to 32.01 eurocents/share. 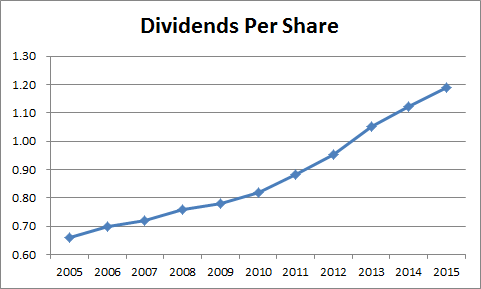 This marked the 21st consecutive annual dividend increase for this international dividend achiever. Between 2005 and 2015, Unilever has managed to boost annual dividends from 66 eurocents/share to 1.19 Euro/share. When evaluating foreign based companies, I focus on the dividend payment in the local currency, because this is what the board of directors has control over. I am familiar with some investors who focus on the payment in US dollars, and therefore reach incorrect conclusions about the length of dividend increases and might end up avoiding a quality company through no fault of its own. That being said, the company has managed to increase dividends every single year since 1995. This means that this international dividend achiever has rewarded its shareholders with a dividend increase for 21 years in a row. You may want to check the dividend history going back to the early 1990s in this article. Between 2005 and 2015, Unilever has managed to increase earnings per share from 1.19 euro to 1.72 euro. It is interesting to note however that while dividends have increased in Euros, they have stayed relatively flat in US Dollars. This is due to the strength of the US dollar, which is also affecting the earnings of multi-national consumer staples we hold like Coca-Cola (KO) or Procter & Gamble (PG). 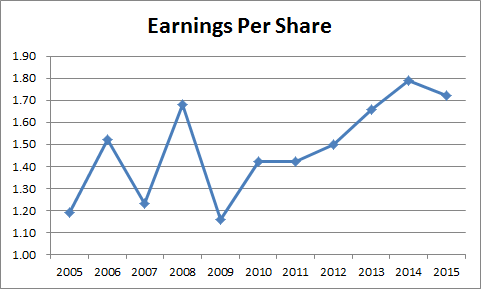 Earnings per share are just a little over the highs reached in 2008. Without growth in earnings per share, we cannot have much growth in dividends per share. On the other hand analysts expect earnings per share of 1.88 – 1.95 euro in 2016 and 1.97 – 2.05 euro in 2017. This is a good time to add that analyst estimates are typically too optimistic and could be incorrect as much as half the time. The company generates more than half of its revenues from emerging markets. The long-term demographic trends could benefit sales in those countries. Unfortunately, the past 7 – 8 years have not been very favorable to those economies as the preceding 7 – 8 years. The other negative of operating in emerging market countries is that you are more exposed to currencies that are continuously debased against developed currencies such as the US Dollar or the Euro. The retail environment seems more competitive than before, with the threat that consumers will switch from branded to generic products, which are not as profitable. On the other hand, companies like Unilever can do well over time by innovating new products or extensions of existing lines, buying out smaller competitors, streamlining operations. Most consumer products are somewhat recession resistant, which makes revenues and earnings and dividends more dependable than most other cyclical companies. The company has a large scale of operations with global reach. It has a portfolio of brands, which customers like and have a potential switching cost for them. The wide scale of operations translates into a cost advantage anywhere from sourcing inputs at advantageous terms to selling finished good through its distributions channels. The company also creates awareness of its brands by heavy advertising and promotion, which has boded well for organic growth rates in the past few years. 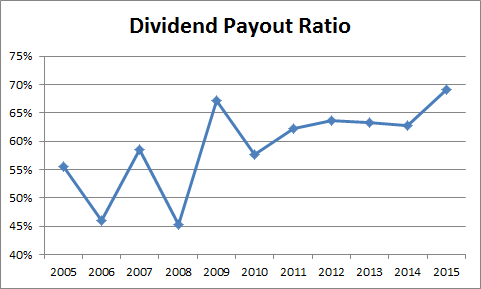 The dividend payout ratio has increased between 2005 and 2015. It went up from 55% to 69%. This is a high payout ratio, that limits future dividend growth. A lower payout is always a plus, since it leaves room for consistent dividend growth minimizing the impact of short-term fluctuations in earnings. I hold shares of Unilever, and would continue to do so, because I believe that the dividend is stable and could grow over time above the rate of inflation. However, I would not purchase shares today due to the fact that shares seem overvalued above 20 times earnings. In addition, I have a very high allocation to consumer staples to begin with, and many of those have not done as well operationally as I would like them to. And even more importantly, I believe that I am closer to the end of my dividend accumulation journey. If I were starting my portfolio from scratch, I may consider Unilever on dips below 34 – 35 euro/share which is equivalent to roughly $38.50 - $39.50/share.